It is with the deepest regret and a very heavy heart that I must announce the death of our dear friend Sheila. Duncan and his 2 sisters were called to the hospital, as she had taken a turn for the worst and she passed away this morning. This will come as a dreadful shock to everyone, but she was much more seriously ill than was first thought when she went into hospital shortly before Christmas. On a personal note, I am heartbroken to have lost such a warmhearted, perceptive, knowledgeable, and wickedly funny friend. I know you will all join me in extending our deepest sympathy to Duncan and the rest of the family and I have told him that we are all thinking of them. Oh my goodness, Karen, I’m in tears as I’m sure all other clickers will be when they read this very sad post. It is truly heartbreaking to lose Sheila, our lovely and treasured friend who pioneered GardenClickers and brought us much humour over the years we knew her. My thoughts and deepest sympathy to Duncan and the rest of Sheila’s family. Oh Sheila … Oh Duncan, and lovely Family, and dear little Grandson … I am so shocked and sad. I echo everything Jane and Karen, and others have said. Dear Sheila, it was too soon … I will miss you so very much…. Rest in Peace, dear friend. Yes Jane, deepest condolences to Duncan and all Sheila’s family. I am so sorry to read this very sad news, I have enjoyed many a chat with Sheila on allsorts of gardening issues,, always with a fair bit of humour as well as helpful comments on many of my questions, her input on this site will be greatly missed. Deepest sympathy to all her family. Sheila was always poised and a great source of humour & wit. A great loss to the family and to everyone on G.C. We will remember her with great fondness and Sheila will be very much missed. My most sincere & deepest sympathy to all of the family at this very sad time. I have shred tears on the sad news about Sheila, A lovely lady who’s humour kept me going through dark times of my own, when I was only a guest looking in. My thoughts are with her family ,She will be missed so much. So very sorry to hear this K.
My heart goes out to Duncan and all the family as well as everyone here onsite. Sheila was a big presence on GC; always thinking of others and giving mindful, sound advice on gardening as well as any life issues. Her sharp wit, knowledge and perceptive kindness are evident in all her posts here and will remain forever strong, as she will to us all. How sad to read this, what a great loss to her family and our little community. So glad I met her a couple of years ago what an intelligent and highly imaginatively witted woman she was, she will be sorely missed by us all. r.i.p. dear Sheila. How very sad. She will leave a big hole in this community. What a sad, sad day. We ‘ve lost a dear friend and I am so pleased I was able to meet her in person at Cardiff and again at Birmingham where we had a lovely chat putting the world to rights. Mornings just haven’t been the same without her wonderful acerbic comments on life, her sense of humour, her delight in the “wee one”………and, of course, Brexit! You have left us far too soon, dear Bean, and we are all going to miss you greatly. RIP. Depest sympathy to Duncan and the whole family, we will be thinking of you all. I do not have the words to express my sadness at this awful news. Sheila, our lovely Beanstew, has made me laugh out loud many a time with the antics of Alfie and I so admired her commitment to helping others, be it at the foodbank or toenails. Considering I never had the pleasure to meet her, she came to feel like someone I know, a lovely friend and part of my clickers family. I shall miss her so much. For once i am stuck for words, Met Sheila at Cardiff show a couple of years back,Liked her from the start, I liked her quick wit and enquiring mind, She will be missed on here,My condolences to the family that she obviously loved. Karen, sorry that I’ve taken a liberty in adding a pic but it’s a good one of my mum, maybe less so of the infamous ‘wee one’. Don’t you be one wee bit sorry Duncan, it’s a beautiful photo of both of them, and very fitting, she adored all of you. 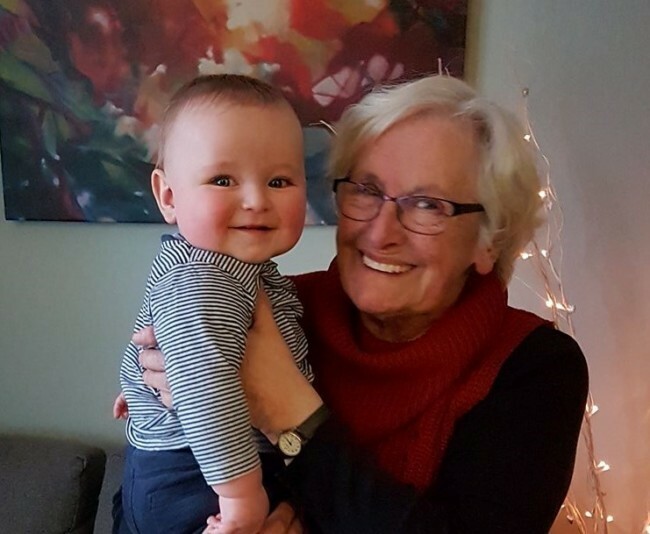 What a wonderful, happy picture of your dear mum and the wee one, twinkle in the eyes of both, just how I remembered your mum when you both visited here in Kent and whenever I met her at GW Live in Birmingham. Hold those memories close. Duncan & family and friends of Sheila aka Beanstew. My condolences and love are with you at this time. Sheila will be missed by very many and she gave much much more than she realised. She was proud and pleased for you all and all of us. I will miss her irreverent humour and wit and knowledge, let alone her friendship, albeit a distant one. ❤️ thank you for posting such a lovely picture of her. Beautiful Picture of a treasured Friend. Thank you Duncan, for letting us see it. My Thoughts are with you all. Only just heard the sad news via Star on the Facebook page. She is having problems logging on to the site but wishes to send her deepest condolences as do I.
Sheila was such a lovely lady and will be sadly missed. I managed to get a new password……so I have done a click. Thanks again everyone. Popped on with a wee update. One of my sister’s and I went to see the funeral director today. He’s a guy we grew up with in a small village called Kilcreggan. It’s also the village my mum grew up in. No matter how long she’d been away she always called Kilcreggan home. My sister’s and I do the same, it’s that kind of place. It’s lovely to say that as of tomorrow she will be back home until her funeral. The funeral is on the 6th February at 11.30am. Holmsford Crematorium in Ayrshire. Family flowers only please. Any donations would be to Shelter Scotland. If you would like to come then you’d be made very welcome. so sorry to read this post, my heart goes out to Duncan and the rest of Sheilas family, truly heartbroken as well, did meet Sheila with some of the other clickers at Cardiff a few years ago, absolutely wonderful lady with such warm hearted humour too, her blogs and clicks were not only humorous but truly also knowledgeable as well, as like so many on here Sheila will be very much missed.